Tuesday, October 23rd (rescheduled) , October 30th, the library will enjoy its third installment in the Let’s Talk About It Oklahoma book discussion series. The book is True Believer by Virginia Euwer Wolff. We are excited to host our visiting scholar, Dr. Karen Neurohr. 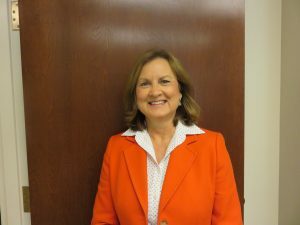 Dr. Karen Neurohr does Community Outreach and Oral History Research at the Oklahoma State University Library in Stillwater. She joined the OSU Library in January 2006. Prior to that, she was a community college library director, and high school English teacher and librarian in southeastern Oklahoma. Her favorite grade to teach was 11th because they study American literature. Karen has been enthusiastically involved in Let’s Talk About It, Oklahoma programs as both a coordinator and program scholar for over 25 years. She especially enjoys how these programs are educational and bring people together to engage in book discussions. She holds a doctorate in Higher Education from OSU, a Master of Library Science from the University of North Texas, and a Bachelor of Arts in Secondary Education, English from Northeastern State University at Tahlequah. For ten years, Karen served as coordinator for dedicating Oklahoma’s literary Landmarks, a national program through the American Library Association. She worked with community members to designate the John Hope Franklin Reconciliation Park in Tulsa as a Literary Landmark in May of this year. Karen serves on two non-profit boards in Oklahoma. She is immediate past-president of Friends of Libraries in Oklahoma (FOLIO), whose mission is “Strengthening Libraries throu Friends of Libraries.” She serves on the Board of Directors for the Friends of the Oklahoma Center for the Book. At one time, Karen helped her husband with ranch work on commercial cattle operations in the northwestern and southwestern United States. Although she and her husband hung up their saddles and spurs, they both love the outdoors, hiking, camping, and their 5 grandchildren. Karen’s heroes and heroines include writers who weave magic with words.